Jarek’s Baby Brickheadz is our judging panel’s choice for the July MOC of the Month. 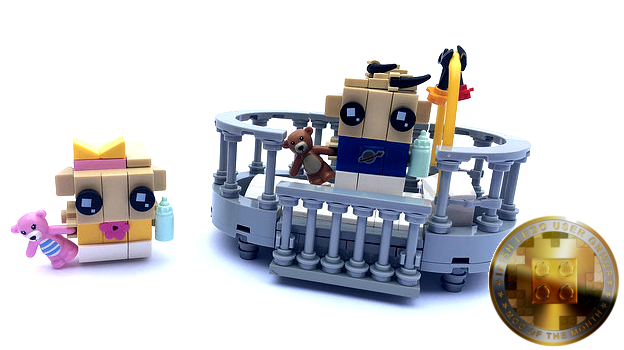 It’s the first baby versions of Brickheadz we’ve seen anywhere and we have to say that Jarek has really managed to maximise the cuteness factor with these little guys. With both a boy and girl version, expectant Brickheadz parents can pick a blue or pink clad child, or if they’re really lucky or weren’t planning properly, one of each. In addition to the best use we’ve seen for the teddy-bear and milk bottle accessories, there’s plenty to love about this creation. In particular we really enjoyed the design of the figures (check out those first hairs! ), the clothes patterns (digging that flower t-shirt) and the aesthetically appealing – but safe – looking cot bed equipped with stimulating toys all included. Just want parents want. Please tell us where you can buy this! All round this build is a great idea and so it’s great to see it on LEGO Ideas (support it here). Great work Jarek! Find more pictures and join in the discussion here. 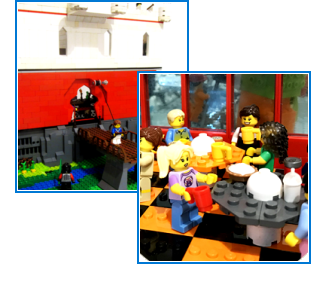 Patrick’s jam-packed with detail Royal Castle and Building the Community competition entry builds were our two runner-up MOCs this month. We were very impressed with all the different imaginative little scenes included in both builds, from the Castle banquet room to the Stormtrooper mechanics. Check out the above links to see for yourself! This month saw Jarek bag 3 points and Patrick, 2. Check out the updated league table here.